I love Penny Reid. I love the Winston Brothers. I love pie. What more is there to say? 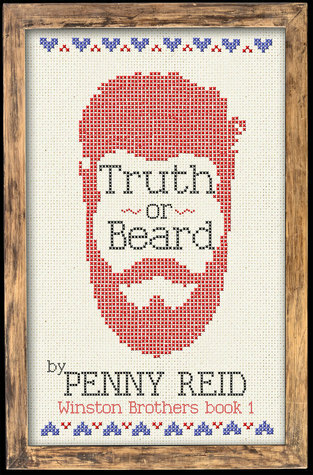 Truth or Beard is the first installment of the Winston Brothers series by Penny Reid. 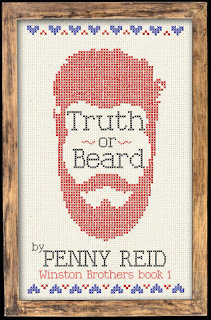 There is some overlap of characters from her Knitting in the City series but you do not need to read any of those before diving into the bearded bros (although you really should because they’re hilarious). Book one in the series centers around Duane Winston and Jessica James. Jessica has (not so) secretly been pining after Beau Winston for the longest time. Beau and Duane are ginger-bearded identical twins. Duane has been infatuated with an oblivious Jessica for what is most likely an equally long time. Mix all of that up on a Halloween night and cue calamity. Check out the book tour for an excerpt of said calamitous moment. The greatest obstacles for Duane and Jessica are time and location. Jessica is a traveler; she’s been gearing up to travel the world while Duane is a family man living where he was born and raised. I really appreciated how Jessica’s love for traveling is portrayed, her struggle for people to accept this need she feels deep down in her soul. One of my favorite quotes from her is, “I was always going to be a circle peg in a world of squares.” Who can’t relate to that? Then there is the struggle to blend lives, to find a way for a nomad and a rooted man to make their love work. Penny Reid has yet to let me down with her humor, charm, whit, and realism. There are a lot of hilarious moments throughout this story. Real laugh-out-loud moments that make your face hurt from trying to maintain composure in a public setting. The beauty of Penny Reid is that there are also real heart-warming, feelings-producing moments mingled with the laughter. Because life isn’t funny all of the time and Reid has a knack for blending the funnies with the feels to create stories that people can relate to on multiple levels.